Step 1 Using a mushroom brush or a soft toothbrush, gently wipe any dirt off the chanterelles. If they are large, thinly slice the stems crosswise and the caps lengthwise. If they are small, just thinly slice the entire mushroom. Step 2 Heat the oil in a deep skillet over medium heat. Add the chanterelles and corn and stir in the salt with a rubber spatula. Cook 2 minutes, stirring constantly, until the corn and mushrooms are well coated. Stir in one-quarter cup water and cover the pan. Step 3Cook 7 to 8 minutes, stirring occasionally, until the corn is tender. Uncover the pan and cook until almost all the liquid is evaporated. Season with pepper and serve. In Recipes-list.com we have selected the most viewed recipes from category - Sides Vegetables Vegetarian . Enjoy the best recipes specially selected for you! 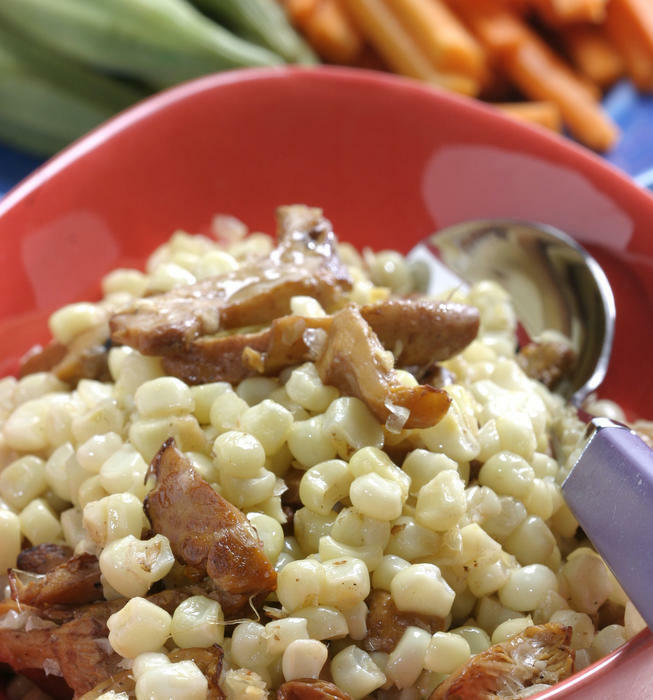 Braised corn with chanterelles is the right choice that will satisfy all your claims.